When Górecki came to the Barbican Hall in June 1993 for a performance of the Third Symphony (‘Symphony of Sorrowful Songs’, 1976), it was at the height of the work’s phenomenal popularity on CD and in concert. During the interval, he was pinned to his seat (partway down on the left-hand aisle in the stalls) by an excited throng of admirers. This work, at that time, touched millions of listeners across the world. For many it was the only Górecki piece that they knew. That same year, the Olympia record label issued a compilation of archive recordings under the title The Essential Górecki – yet, boldly, these were not in the vein of the Third Symphony. Rather, they were earlier works, including three orchestral pieces: Scontri (Collisions, 1960), Refrain (1965) and Old Polish Music (1967-69). One wonders how many lovers of the Third Symphony bought the CD only to be taken aback by its contents. 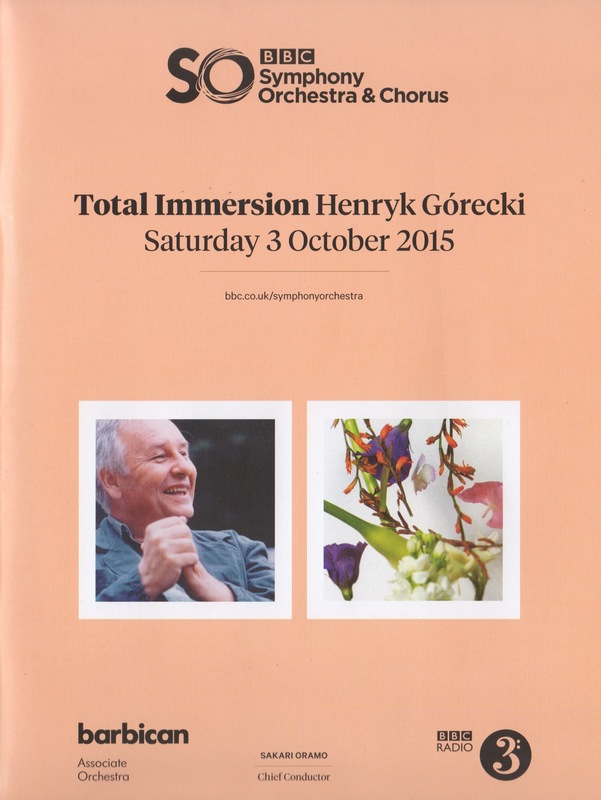 Both events illustrate the apparent problem of defining the essence of Górecki. He was by no means the first composer whose works changed radically over the years, but the music up to the mid-1960s, if not the early 1970s, remains largely unperformed. This does him an injustice, as he shaped his musical ethos in the late 1950s and early 1960s. With his poor Silesian background, he needed all the self-motivation he could muster, and a supply of bootstraps, to get himself to music college in Katowice and then graduate with Scontri. He outstripped all other Polish composers in his manipulation of serial techniques, exhaustively examining his material for its sonoristic qualities, and generally becoming the most colourful and profoundly serious composer of his generation. Never one to seek the limelight, he was determined to remain his own man, and work at his own pace, at a time when life was grim under communism. He first noted down his youthful mantra ‘Energy-Movement-Life’ in 1962, while he was delving into the dark sonorities of the aptly named (though not religious) Genesis cycle (1962-63). He then developed a second sequence of pieces ironically called Little Music (1967-70), where he put ‘the most stringently restricted material to maximum use’. He maintained this demanding outlook to the end of his life, whether his music was joyful, contemplative or sorrowful. A major turning point came with his overt turn towards sacred topics in the 1970s. This was immanent in earlier pieces, such as in the movement titles in the otherwise secular First Symphony (1959): ‘Invocation’, ‘Antiphon’, ‘Chorale’ and ‘Lauda’. The vast majority of his works, with or without voices, have some explicit or subliminal connection with the sacred. But that does not mean that they are merely pious. On the contrary, Górecki questioned his texts and sources ruthlessly, and he never thought of his major pieces as inherently easy on the mind or the ear. Certainly, the vocal works – whether they have sacred or folk texts – tend to be meditative, as the selection in this Total Immersion day demonstrates. The Third Symphony is the obvious example, and its impact is largely due to Górecki letting the music breathe and evolve at its own rate, with his own contribution very much in the background. Yet a comparison with the other two big works of the 1970s – the Second Symphony and Beatus vir (1979) – shows the vigour and grit which he brought to bear on other texts. At the other end of the scale, his folksong and hymn arrangements from the 1980s intentionally have no grand ambitions. Górecki was beset by health problems since he was a small boy, and his strength of character undoubtedly developed in part because of his determination to surmount setbacks and multiple operations. It was remarkable that he survived as long as he did (he died in 2010, aged 76). The early 1980s were a difficult period, and he kept his spirits up with small-scale choral settings and found new energy as a result of commissions for chamber music. His instrumental works starting with the trio Recitatives and Ariosos, ‘Lerchenmusik’ (1984-86) are quite distinct from his vocal music. They became innately symphonic, interested less in prayerful meditation (demanding though that is) and more in the traditions of contrast and development. He also allowed his playful side to come forward, although the uncomplicated exuberance of the Harpsichord Concerto is replaced by the darker entertainment of the clown, as in Little Requiem (1993). The Górecki fever of the early to mid-1990s was both a blessing and a curse. He was very moved by the love and attention, but the prolonged demands on his time and the diversions of family life and grandchildren put him off his compositional stride and he hesitated to release new compositions. The first work to emerge was the Third String Quartet (‘…songs are sung’, 1995), an expression of mournful fragility with the air of a swansong. Yet he held it back for another ten years, during which he wrote some modest sacred pieces, including Salve, sidus Polonorum (1997-2000), which he had partly drawn from the hour-long Sanctus Adalbertus (1997-98) that will be given its world premiere in Kraków next month. Górecki put distractions aside for a while in 2005-06 while he wrote Kyrie and the Fourth Symphony, but, as was his wont, he held on to them and they had to wait until 2014 for their first performances. The unsettling of Górecki’s compositional momentum is a cause for some regret. Yet it was also part of the man. He wrote as he wanted, when he wanted, and he rightly felt under no obligation to fulfil anyone else’s expectations, only his own. His distinctive and uncompromising music from op. 1 to op. 85 is witness to that.